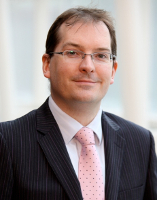 Anthony has worked in the financial services industry for 15 years and joined Northern Trust in October 2007. He manages Northern Trust's Asset Servicing Product Innovation Group, which is responsible for developing new products, keeping the business up to date with technology changes in the both the financial and non-financial markets, as well as looking to access new external technologies and services that will enhance our clients' investment management processes. During his time at Northern Trust, Anthony has run the EMEA Product Solutions group, has built out Northern Trust's collateral and liquidity solution for clients who will trade derivatives under the EMIR regulatory framework, and has run the EMEA performance analytics function supporting both asset managers and owners. Prior to joining Northern Trust, Anthony worked for Mellon Analytical Solutions (MAS) where he was responsible for relationship management, working with over 200 asset management clients. Earlier, he worked for Merrill Lynch Investment Managers, where he supported the international book of business for the performance team, and at Intersec Research.